One of three photographs taken by David Samuel Rees (1884 - 1976), a keen local amateur photographer and grandfather of the contributor. 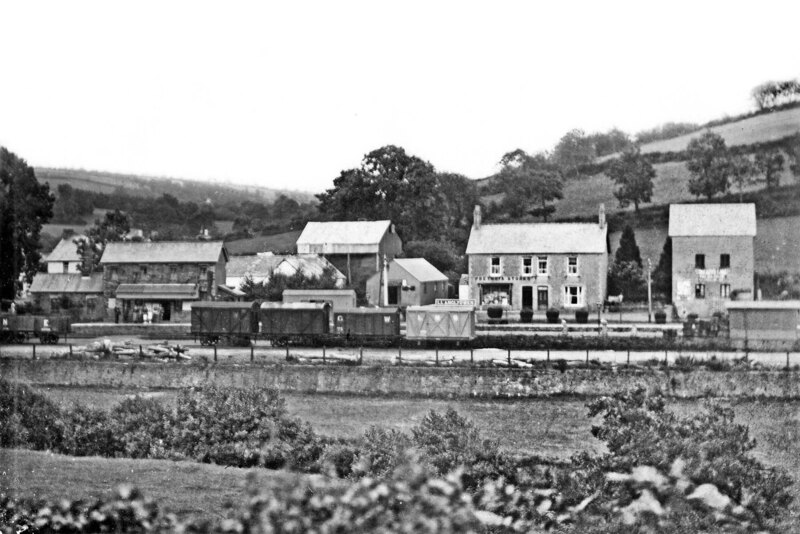 The vantage point is the grounds of Abertaf, a cottage then owned by the contributor's great aunt and located across the Afon Taf valley from Llanglydwen station. This particular view was reproduced as a postcard, this survivor being postmarked 26 July 1926. The presence of the LMS van and LNER wagon tells us the photograph was taken after The Grouping, therefore we can date the photograph to no earlier than January 1923 and no later than the postmark date. A group of people stand on the platform, of which at least two are staff, obviously posing in awareness of the photograph being taken. Behind the station is Pretoria Stores, a general store and to its right a building displaying a Thorley's Cake sign. It is probably an agent's office. As tempting as the name sounds, Thorley's were in fact suppliers of animal foodstuffs and had a factory at King's Cross. Thorley's enamel advertisements could bear the name 'Thorley Cake' or, as here, 'Thorley's Cake' and quite a few survive today in either form. To the left of Pretoria Stores is Pretoria Mill which, although unconfirmed, may have been connected with Thorley's. Of the goods vans, the squat van coupled to the LMS van is an 'Iron Mink'; a once prolific and highly successful type copied by several other railway companies. 'Mink' was one of numerous telegraphic code names given to railway wagons, particularly by the GWR, and often borrowed from some form of animal life of which perhaps the best known is the 'Toad' brake van. The practice is still in use today to a limited degree and now almost exclusively on engineering vehicles.